SUMMARY: At MarketingSherpa Email Summit 2015, attendees will hear how Ferguson Enterprises generated more than $10 million and growing in online sales by enriching the customer experience. Mary Abrahamson, Email Marketing Specialist, Ferguson, will take the stage to share the customer journey of two personas as they move through the sales funnel. Learn how Ferguson went from one email per event to a segmented series as well as how it optimized its onsite event registration for better retargeting. This campaign earned Ferguson the B2B Best in Show Award, sponsored by BlueHornet, for MarketingSherpa Email Summit 2015. "You may not have heard of Ferguson, but you likely have our products in your home and office," said Mary Abrahamson, Email Marketing Specialist, Ferguson. Ferguson, the largest wholesale distributor of plumbing in the U.S., has evolved over the past 60 years from a local distributor to an $11 billion company with more than 1,400 locations and more than 20,000 associates around the country. Ferguson is one of the top distributors of HVAC, waterworks and industrial products in the U.S.
"In a nutshell, we want to provide world-class customer service and a great place to work for our associates — never be satisfied with a status quo, always look to improve for our associates, customers and vendors," Abrahamson said. Ferguson's customers come from several sectors, including plumbers, builders, remodelers, waterworks, HVAC, mechanical contractors and facilities management. Every year, Ferguson hits the road to produce more than 90 trade show events funded by contributions from sponsoring vendors. Part of a larger marketing cooperative program, Ferguson Rewards, the events allow Ferguson's vendors to get in front of customers and promote their brands and products. The trade show events kicked off in 2011 and begin each year the first week of March and end the third week of October. 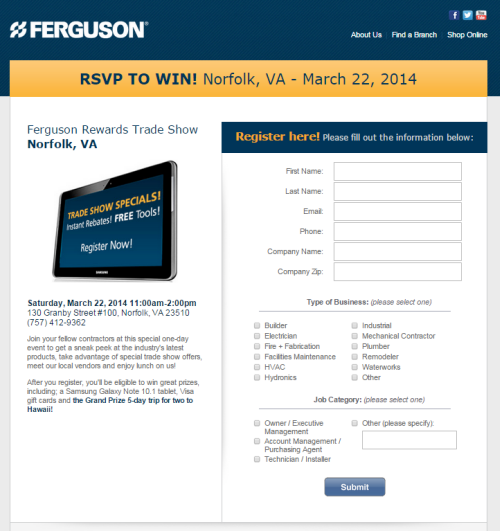 To get current customers interested in other products Ferguson offers, the company would email invitations to attend a Ferguson Rewards trade show event. The email sent before the event occurred had no registration information and provided no chance for follow-up for Ferguson. Each send also had to be manually created, essentially leading to the same email being changed and sent more than 90 times. At the event, attendees had to physically fill out cards the day of the event, and the cards could spend up to three weeks in transit back to Ferguson headquarters in Newport News, Va., only to then be manually uploaded to the email database. With problems mounting, Ferguson needed a way to leverage a more engaging email strategy to offer a chance for Ferguson Rewards trade show attendees to pre-register and generate more excitement around the events. The team looked to automate the email process to allow for tailored content based on the customer type and segment. Having data was also key in this effort because, at the time, there was no reporting around event attendance and, according to Abrahamson, "all metrics were assumed or hearsay." The team had a goal to digitize the on-site registration process at the Ferguson Rewards trade shows to eliminate the delay in adding in new email subscribers and the need to decipher illegible handwriting on the cards. A program manager at Ferguson initially sought out to automate the invitation email, as the process of manually creating an email for each event was draining resources for the team. Through this initial goal, the opportunity to digitize the event sign-in and registration process was also put forward. Teaming up with Whitney Porter, Senior Marketing Manager, Ferguson, the marketing team presented the idea for taking Ferguson Rewards events to the next level with a more robust and automated email campaign, along with a modernized on-site registration capture. Abrahamson was brought onboard, and on her first day, she began working on building out the project. After seven months, through partnering with an email marketing agency and collaborating on ideas, the campaign was implemented. In the setup phase the month before the campaign kicked off, the Ferguson team dedicated time to test and ensure all potential scenarios of people pre-registering online would work with the system. Once all of the pieces were ready to go, Ferguson made an announcement to its brick-and-mortar locations explaining all of the new changes to the program. Ferguson sends one invitation email to its customers in the email database. This email is sent 14 days before a Ferguson Rewards trade show event occurs in that subscriber's geographic area. For each show, this invite was sent to all applicable trade customers, such as electricians, plumbers, remodelers and builders who were either attached to the associated Ferguson branch from self-selection or customer account information or within a 20-mile radius of the associated branch location. 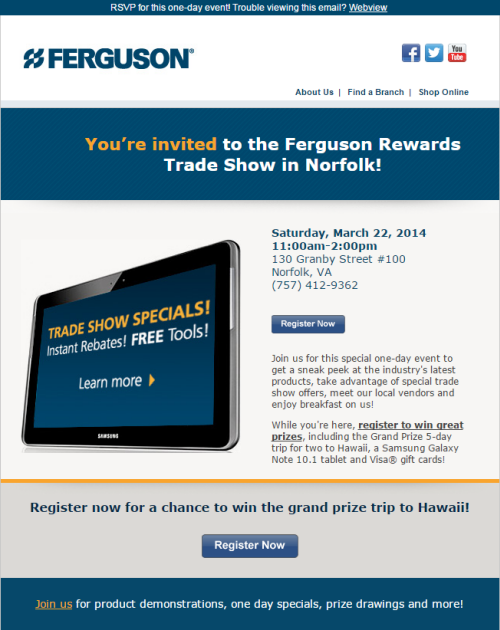 In this email, the subscriber is notified of the Ferguson Rewards trade show event in their area, with the date, time and location of the event. The email copy explains that this is a "special one-day event to get a sneak peek at the industry's latest products," as well as have the opportunity to take advantage of exclusive trade show offers. If no action was taken in the first email in two days, then a second reminder email was sent, this time with more urgency. "We do change up the subject line and the pre-header text … Then we change up the image in the email to show them the setup of the show. Maybe there is somebody who has never been to a Ferguson Rewards Trade Show, and they would like to know what the general look and feel of the show is," Abrahamson said. Sent 12 days before the trade show event, this next send has added urgency in the copy, explaining that "spots are filling fast." One final email is sent seven days before the event if the subscriber still has not taken action and pre-registered. The urgency in the copy is emphasized again, encouraging subscribers to not miss out on the opportunities the event has for them. Overall, Abrahamson explained these pre-registration emails have about a 10% effective rate and typically, "subscribers feel that final sense of urgency in the last reminder." If the customer did pre-register, they received a confirmation email with vendor-specific content customized by the customer type. This information was gathered from the registration page, or was based on the data Ferguson already had on that specific customer. Ferguson has 43 vendors that each submit coupon content, and each customer received three in the confirmation email, based on the field they are in. For customer types that don’t have enough vendor-sponsored content, Ferguson will fill empty slots with its own coupon content. Once a Ferguson Rewards tradeshow attendee is pre-registered, they are now signed up to receive future email communications based on the criteria that they have filled out and provided to the marketing team. Before the event, the subscriber will receive a reminder email about the upcoming show. At this point, a subscriber may also receive more content from Ferguson, such as PDFs explaining more about a specific offer a registered attendee can attain at the event. At the event, Abrahamson and the team needed a way to improve the check-in and on-site registration process. 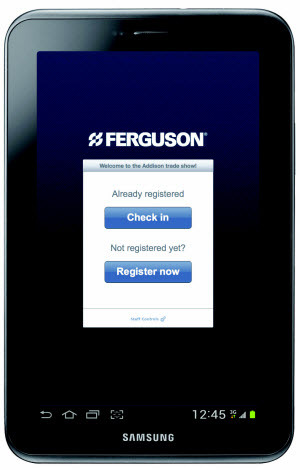 Whereas before, physical cards were filled out by attendees and had to be transported and manually entered into Ferguson's email database, the team now sought to implement a digital sign-in process via tablets at each event. The team wanted an "app-like" experience on the tablets, and they moved from an opt-in concept to a registration concept. At an event, several tablets are set up in a Ferguson booth at the front of the entrance, and attendees may check-in if they have already pre-registered or register if they had not done so already. Once registered, their email addresses were immediately incorporated into the Ferguson email database and entered into the welcome program into their appropriate track based on their customer profile. Vendors at the event do not receive this information directly, but Ferguson branches receive reporting from this registration information each week. "Internally, we do a lot of reporting on this information, which has led us to make a lot of changes to our processes for next year … as we glean new information about our current customers," Abrahamson said. A thank-you email is sent to event attendees 24 hours after the event concludes. In the send, trade show specials are reiterated, and attendees are also given the opportunity to enroll in Ferguson Online, the company's ecommerce platform for businesses. According to Abrahamson, about halfway through the shows in 2014, the team realized there was a missed opportunity to gather feedback on the event from attendees. To address that issue a survey was added to the thank-you emails, asking attendees about their experiences. "In terms of me and the digital team, the most important question for us is, 'How did you hear about the Ferguson Rewards trade show?' Nearly 60% of them respond via email marketing, which is certainly great to hear," Abrahamson said. "When it comes to [campaigns] like this, especially with how complicated businesses can be, and how complicated customers can be, especially at a larger company or even smaller companies, all the different customers types, especially in the B2B business, it's kind of like playing a game of chess," Abrahamson said. "You're constantly needing to be a couple of steps ahead of them." Ferguson saw that only one out of five customers were in its database before attending a trade show, and now, with more valuable registration information gathered through the email campaign as well as digitized registration at the event, the team can capture more complete customer profiles for better targeting and messaging. This effort has proven so successful that the team will start implementing tablet check-in at other events Ferguson is present at, including NASCAR shows, baseball games and other hospitality events. This will allow Ferguson to better understand who attends and what their behavior is post-event, allowing for better follow-up for these customers. One of the biggest lessons Abrahamson and the team learned was to truly discover what worked best for their customers. "We took a large leap to go all tech on our customers. It's important to balance the takeaway that your customers will get [at the event] versus what you will able to give back to them from implementing something new like this, even if they may not appreciate it at the time," Abrahamson said. The tablet check-in feature proved successful for capturing customer data quickly and more accurately for the team, but based on the average age and comfort level with technology, the tablet was looked at as a challenge for some attendees. "Bridging that gap between what works in terms of capturing information quickly and what makes your customers comfortable is important," she said, adding in the future, attachable keyboards will be added to make the on-site tablet check-in as easy as possible. This effort as also led to other takeaways to be implemented in 2015. For example, the team will explore more ideas around incentivizing pre-registration, adding one additional question so the program can expand to other events and evaluate the trade show attendee lifecycle with market research to understand the true value of the event and attendee. This campaign is one piece of Ferguson's marketing strategy that will be presented at Email Summit 2015 in Las Vegas, Feb. 23-26. Abrahamson will take the stage to share their story of transformation, with tactical tips any marketer can apply to their own efforts.